The scene in the first Jurassic Park film where the two stalled Land Rovers are attacked in the rain by the tyrannosaurus is one of the most memorable things I ever saw in a theater. CGI wasn’t a common thing back in 1994, and we couldn’t just put Andy Serkis into a motion capture suit and tell him to go eat some people. It’s a taut scene even today, and now it’s been rebuilt for VR in Unity 5. You can watch the demo in the video below to get a sense of how it looks, although obviously a VR experience doesn’t translate fully to YouTube. It’s an amazingly faithful recreation of Steven Spielberg’s iconic scene in Unity by an itch.io user called, appropriately, unity5games. We’ve got tons more things that want to eat you in this list of the best horror games for PC. 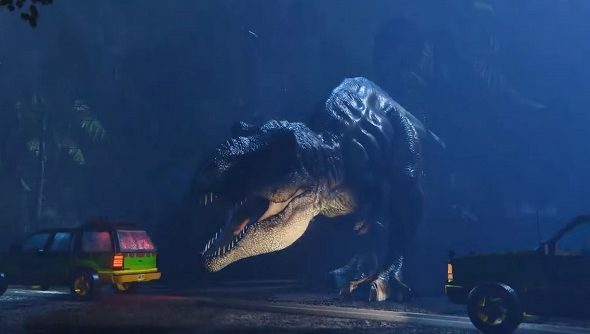 Unity5games built all the models and created all the textures seen in the demo, which is a pretty remarkable achievement – the lighting and rain effects are all terrific, and even the motion in the T-rex’s baleful eyes is unsettlingly close to the film. You get to sit in one of the Jurassic Park Land Rovers as the T-rex circles. Your job is to make it to one of the small shelters near the road, ideally without getting eaten. There’s not a lot to the demo, but it looks terrific and the chance to experience an iconic movie scene in first person is extremely appealing. Being chewed by teeth the size of bananas, less so. Sure, you can see some seams and texture stretching if you’re looking close, but again it’s different watching on YouTube than experiencing it in VR. Dark Side of Gaming brought this demo to our attention, and you can find the T-Rex Breakout scene over on Itch.io.